Read Next Step Family of Products Archives of Older Product Reviews by TDmonthly. Watch Next Step Family of Products Archives of Older Product Videos by TDmonthly. Next Step Family of Products is proud to introduce our SportsRing the first of a unique line of products. 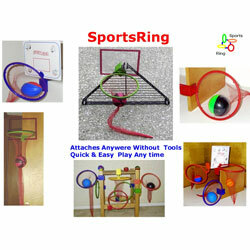 The SportsRing a multiply position sports and game toy that allow special play characteristics for many type of sports! A hoop for Basketball, A receiver’s hands for Football, The strike zone for Baseball or Softball, A goal for Soccer, A trainer for Hacky Sak and many more. Imagination is the only limit. Assembly is quick & easy and it attaches in seconds without harm to the surface. The SportsRing comes in 5 colors Blue, Red, Orange, Green and Yellow. that gives our toy creative appeal. This toy is fun for the whole family at home or away for the kid in everyone ages 4 and UP. Durability, Versatility and price value are the cornerstones for our products. Our packaging like our products has the versatility to meet your needs. (A) Packaged with a ball so fun will start as soon as the package is opened. 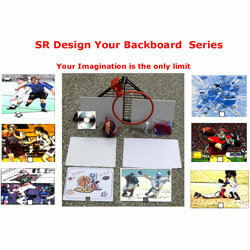 (B) Package without a ball to promote the sale of your foam sport balls of various sizes. We can deliver our product to you the way you need it, when you need it.